Connie Britton - InStyle Magazine ï»¿May 2019. Elsa Pataky - InStyle Magazine (Spain) May 2019. 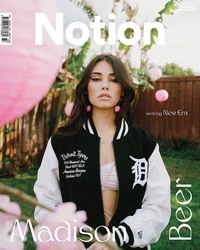 Madison Beer - Notion Magazine Issue 83 Spring 2019. Katy Perry - ''American Idol'' Arrival Los Angeles May 20th 2018. Sofia Milos - Italian Institute of Culture Los Angeles Creativity Awards Hollywood January 31st 2018. Erin Richards - ''Robin Williams: Come Inside My Mind'' Premiere New York City July 12th 2018. Hailey Baldwin - Levi's Party in the Desert Coachella Valley Music and Arts Festival Indian Wells April 13th 2019. Emily Ratajkowski - Levi's Brunch Coachella Valley Music and Arts Festival Indian Wells April 13th 2019. Katharine McPhee - In Style Gifting Suite Brentwood August 14th 2016.